Jan Forbes is a pen name used by playwright Martha Keltz for a series of nonfiction, essay and art books published by TC Pubs, which is an imprint of Studio Editions. Studio Editions was founded in 1990 and over the course of nine years published 11 books of 38 dramas, including some adaptations, written and frequently illustrated by the author. The publications followed a 20-year involvement with all aspects of stage production. An additional Studio Editions publication is the Synopses Pamphlet, a 33-page illustrated pamphlet offering thorough descriptions of the 38 dramas and their production requirements. Other publications include a short story; Ein Maerchen; a book review; and illustrations for two children's books published by the Mercury Press, New York. TC Pubs was founded in 1997. Many of the dramas have been produced in little theaters and at the college level. The Fulcrum was produced by the University of Science and Philosophy (the Walter Russell Foundation) when it was located at Swannanoa, Waynesboro, Virginia. A Twentieth Century Trilogy has recently received recognition with its inclusion on the Glastonbury Archives internet sites created by Palden Jenkins (see the links page). Further biographical information about the author is available from the book published in full on this site, American Lives. The author would like to thank JoAnn Hartman for her comments and suggestions for the first section of this book, "War: A Military Family." Special thanks are also extended to Beverly Jones, Dale Pond and Palden Jenkins for their continued encouragement and support. 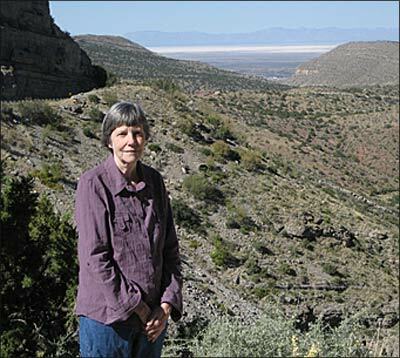 The author in 2008, near Cloudcroft, New Mexico. White Sands in the background. Copyright © 2001 by Jan Forbes · All rights reserved.